April brings showers, but in my heart, April also brings in sweet nostalgia of Poila Boishak or Bengali New Year. The smell of new clothes, the rolled calendars that the shopkeepers hand out as it marks the beginning of their financial year, the stiff paper boxes full of sweets and savories neatly tied with bright yellow or pink strings and yes – all the good things made at home to celebrate a new beginning. Ah! 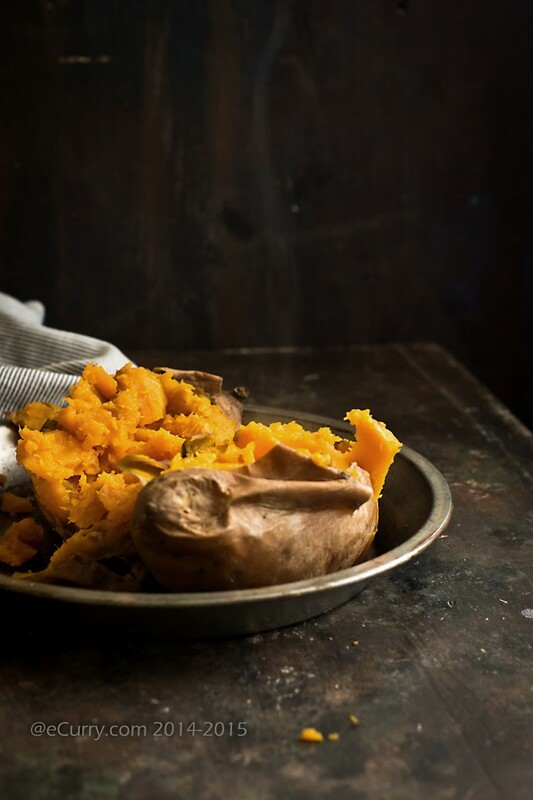 how the feel and the mildly sweet aroma of the steaming hot sweet potatoes make me want to go back home and try to reach back to those gone away day… to the people of my heart who are no more. Red skin sweet potatoes with thin skin, the sticky pale white inside, my maa, my dida, the old house, the kitchen I spent so many hours watching my maa cook, the smell of new dresses that I wore as the evening softly enveloped the hot Poila Boishakhi day – year after year… seem like the things of the past now. 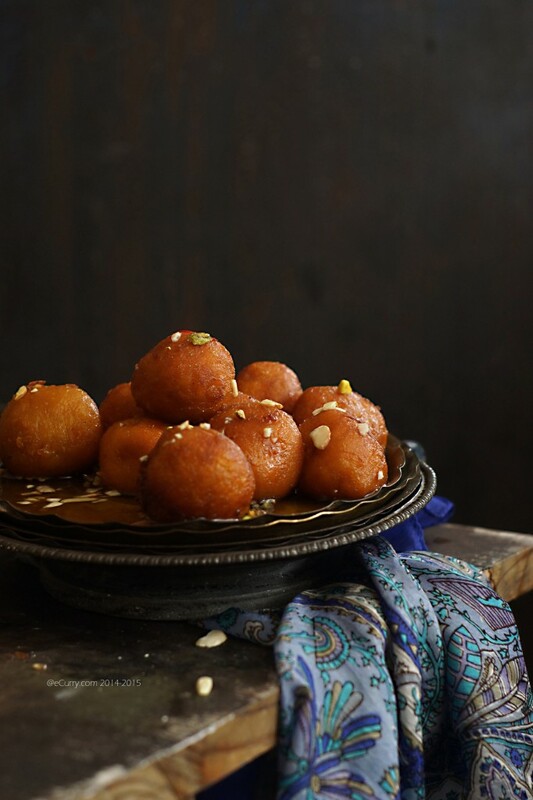 Pantua is the Bengali version of Gulab Jamun: a sweet ball made with milk solids of slow cooked milk, with a cardamom seed in the center. 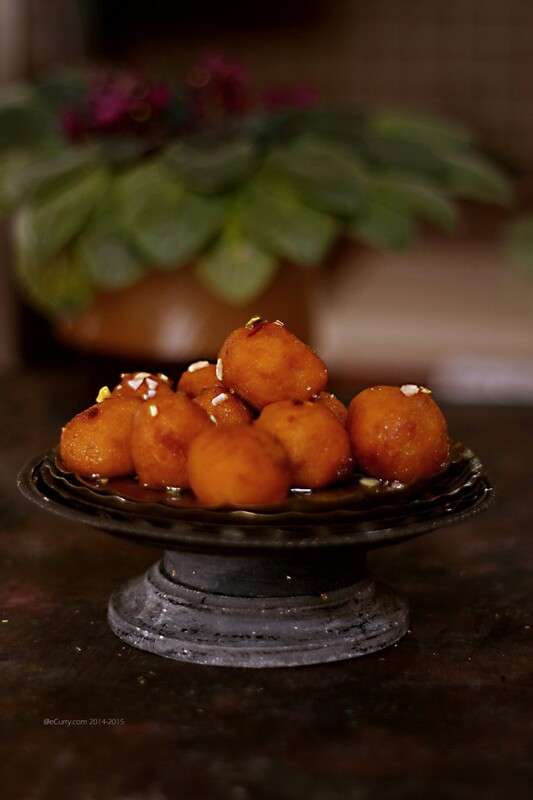 The rolled spheres are then deep fried and dunked in sweet cardamom flavored sugar syrup. In this case mashed sweet potatoes are used instead of dairy. The balls are filled often with milk solids, but any filling may be used, leaving options to make this completely dairy free. I have used powdered almonds to fill them today. I love it this way, as the almonds also add a nutty flavor and makes the dessert way lighter than the traditional version. On this particular day, there are a variety of delicacies made and different homes make different kinds of sweets and some savory dishes. The women folks of the house do get busy in the kitchen while the dads make it special by visiting stores and social functions with the excited kids. 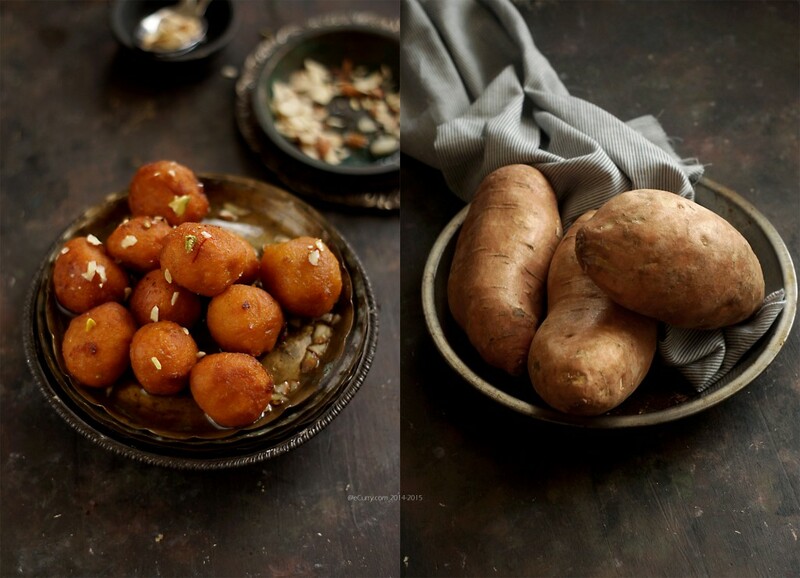 Ranga Aloo r Pantua is not exactly one of the very typical desserts that would be made at this time. This is more of Poush Sankranti (or the end of the winter festival). 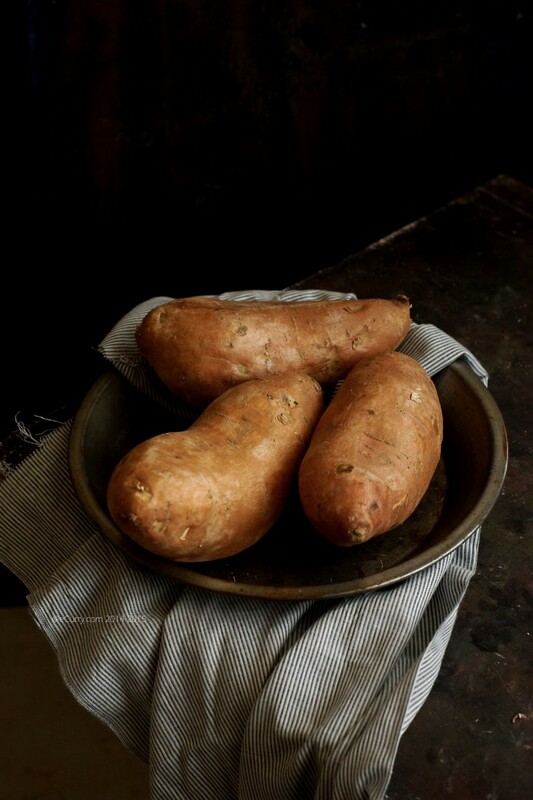 But the sweet potatoes are in plenty now here and I have been craving for these for a while now. So why not? While making this I got transported to the kitchens I grew up in. My maa’s kitchen. Also my dida’s – my maternal grandma. And the kitchen of the “Purono Bari”, the old home. Not that I cooked in this particular kitchen of the Purono Bari, but it still left an imprint on that tender heart. The “unun” or the clay oven that was lined along the wall by the window, the iron utensils and the hustle of the cook, my maa, my aunts, my grandma and also my great grandma all come together to weave a story in my life. mash them well and combine the flour and cardamom. Scoop, fill, shape them and deep fry in batches. Drop them in the sugar syrup. The memories of the Poila Boishak root from that part of my life – where we all lived together in one big house. The times when my cousin and I were very young and would run up to the terrace with bowlful of sweets from the kitchen, sit in a corner and relish them. It seems like the foundation of that very house has absorbed a lot over the years and it whispers to me of the days gone by when I go back and walk through it. There have been many changes. The original kitchen is gone, and so is the dining room and the garden surrounding it. But it still remains the place where my life began. 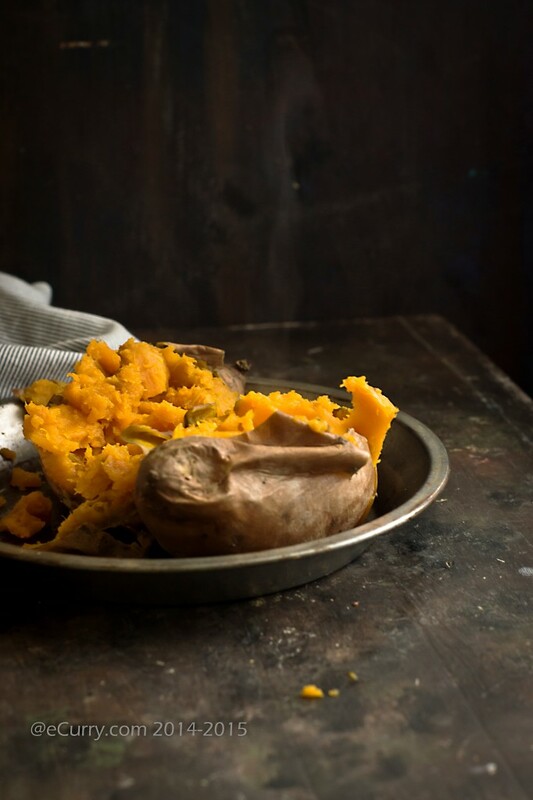 While I poked into the steaming hot sweet potatoes, it suddenly got the feeling that something was different, though I could not quite figure out what. It took me a few days, but after asking around I remembered that the sweet potatoes in India are a different variety. They have a deep skin but the inside is pale white, quite unlike the shocking orange flesh that we find here. We “Bongs”, as we are fondly called, are very passionate about our “sweet” connections: Roshogolla, Sandesh, Payesh, Pithey and the infinite list goes on… In scientific terms, a person from Bengal (East or West Bengal) is called a “Bengali”. We are “sweet” people by birth and speak a mellifluous language which flows like soft ripples in a stream. The culture is deeply rooted in art, music and theatre. Along with all these, there are also an ardor for adda and food. We can never miss a chance to do a little “Mishti Mukh“- sweeten our mouth for good luck or start a new venture/journey. Poila Boishakh, or the first of the month of Boishakh is a new beginning; so just the appropriate time for “Mishti-Mukh“. For Indians. any festival or tradition is turned into an occasion to cook, eat and mingle with friends. For me Poisha Boishakh always had been just another excuse to indulge and make merry. Crisp new clothes, school holidays, shop hopping and plenty of food mark the highlights of the day. 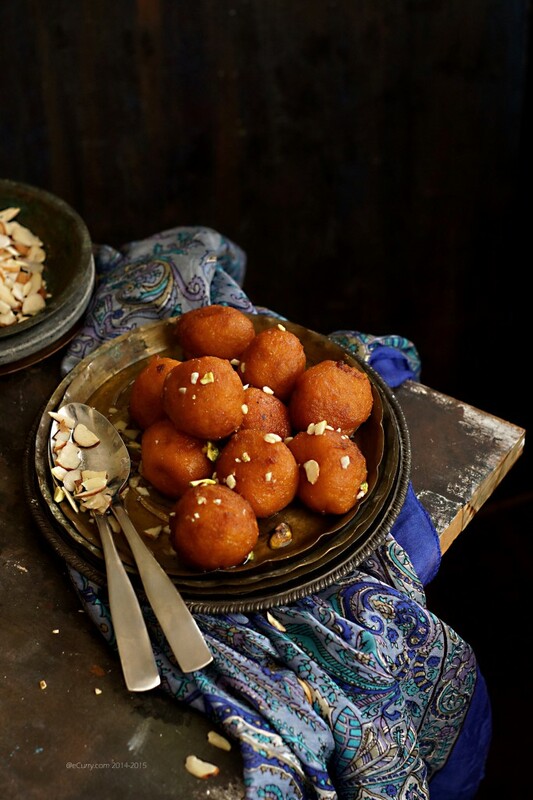 Desserts, like this are usually served at tea and as snacks in a Bengali family. Now let us talk about the giveaway. 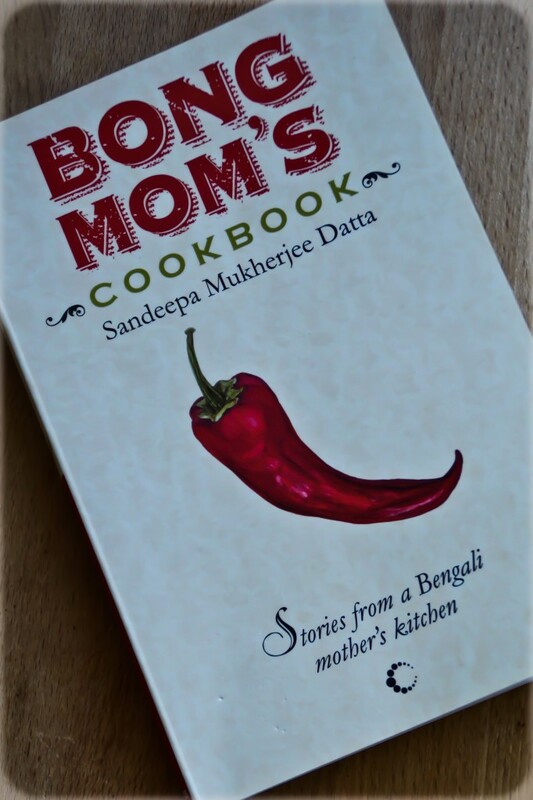 I have been reading Sandeepa’s Bong Mom’s Cookbook even before I myself had started blogging. Her blog have been my connection with my home; familiar food, familiar scent is brought to life by her beautiful story telling. And the book offers no less. It is not just another recipe book. It is a tale told with wit and friendly, honest humor. 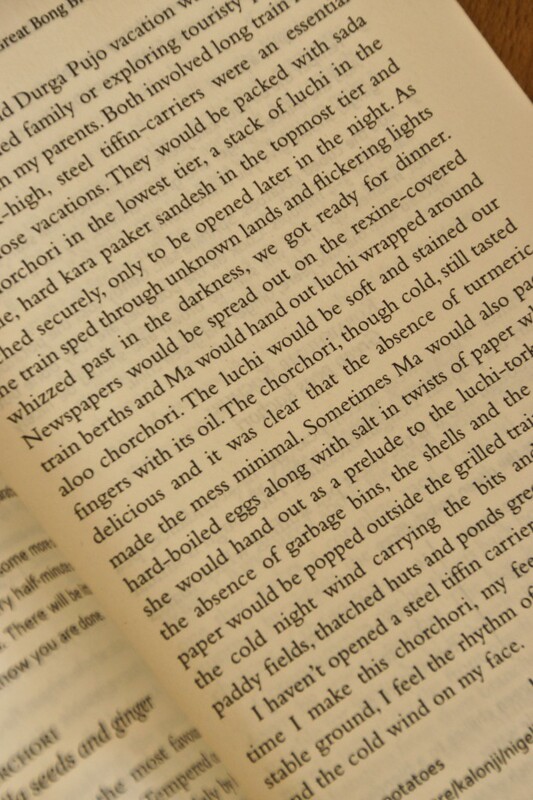 I could not put down her book until I reached the last page, following her every word with captivating attention. 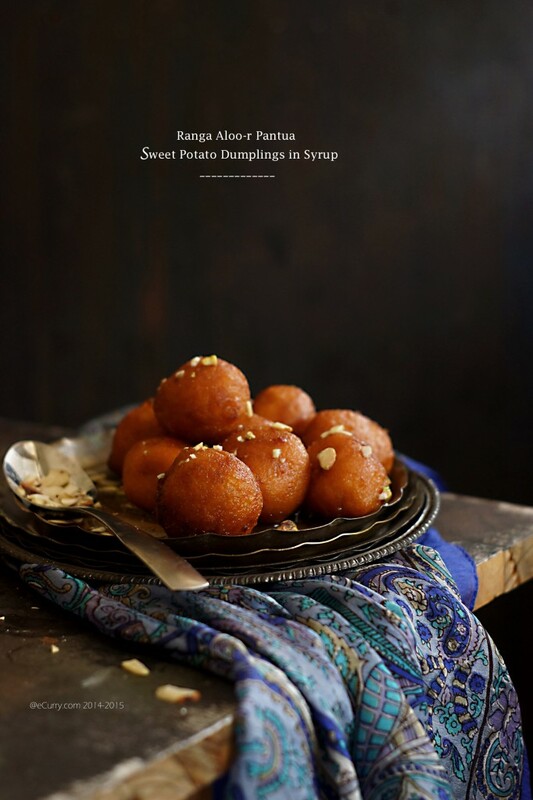 I could relate to the food and the settings; the Bengali weddings, her childhood surrounded by the Himalayas, the train journeys and her summer vacations in her grandparents’ home, the initial trials of her cooking episodes, her move to the States, and now her life in the States as a working mom…the book envelopes of lifetime. …each and every story stirs a memory of back home and also of my favorite recipes. The recipes are woven into her heart warming stories. The style is lucid and conversational. So you will see, smell and build a picture in the canvas of your mind. You will experience life, culture, traditions and food through Sandeepa’s eyes as a child and also as a grown up. It is something we can all relate to. Even if you are not a Bengali. This is the kind of a book I want can carry on a trip and this is also the one which has found a permanent place on my favorite shelf, by the kitchen. I am giving away a copy of this book. Just leave a comment and a contact name/email. You DO NOT have to “Like” or “Subscribe” or “Follow” but you can spread the word via social media. The last day to leave comments will be April 20, 2014. I will announce the winner the following week. The giveaway is open to readers within United States and I will mail the books only within USA. Now let me take this opportunity to thank all my readers for your support, for reading the blog even at times when I have left it aside with no updates, for your feedback and comments. Wishing you all the best and hopefully the tides of Poila Boishakh brings in lots of happiness to all of you! approximately 5 tablesoons khoya/thickened milk available in Indian groceries (or ricotta mashed smooth or use about 3 tablespoon of milk powder combined with as much milk/or heavy cream to make a thick paste) – you may also use coconut or powdered nut made into a paste with adding water or cream/milk. **Note: the amount of the flour is approximate. 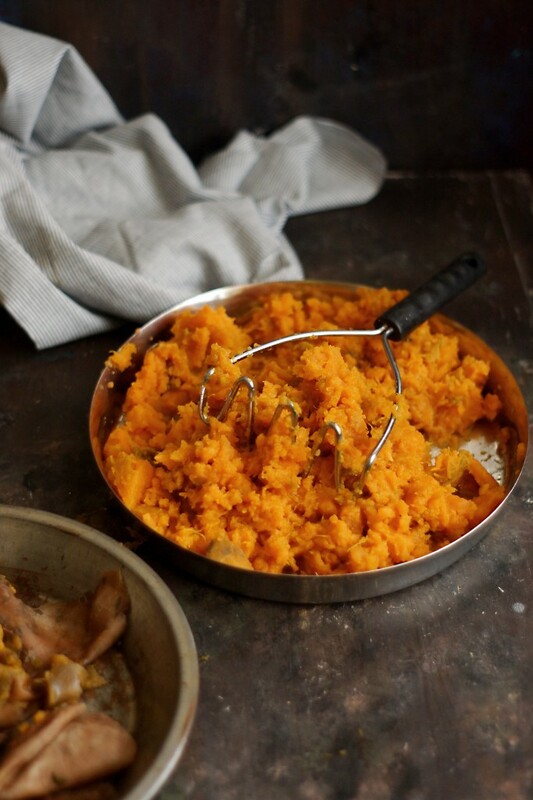 The purpose of the flour is the bind the sweet potatoes so they do not break while deep frying. If you have potatoes where the water content is more or less, adjust the amount (add more flour if the potatoes are too soft and vice versa). If you see you are having to add too much flour, add a very tiny pinch of baking soda to the dough just before you fry. It is not at all traditional to add the soda, but given the dough gets too weighed down with the flour, it just helps to add a little fluff. The filling in the pantua has more to it than just the taste. It also creates a hollow makes the dumplings lighter, which also allows better absorbtion of the syrup. We are not fond of khoya or any cheese/milk filling. I have used just powdered almonds today. 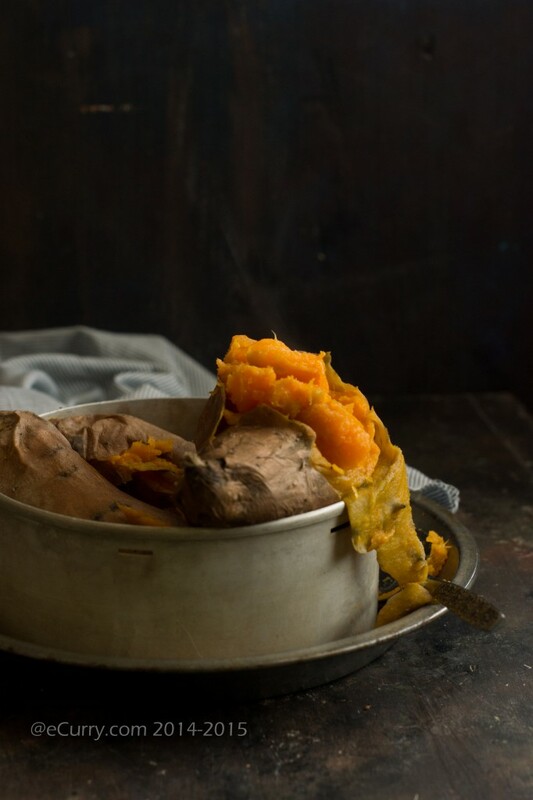 Wash the sweet potatoes clean. 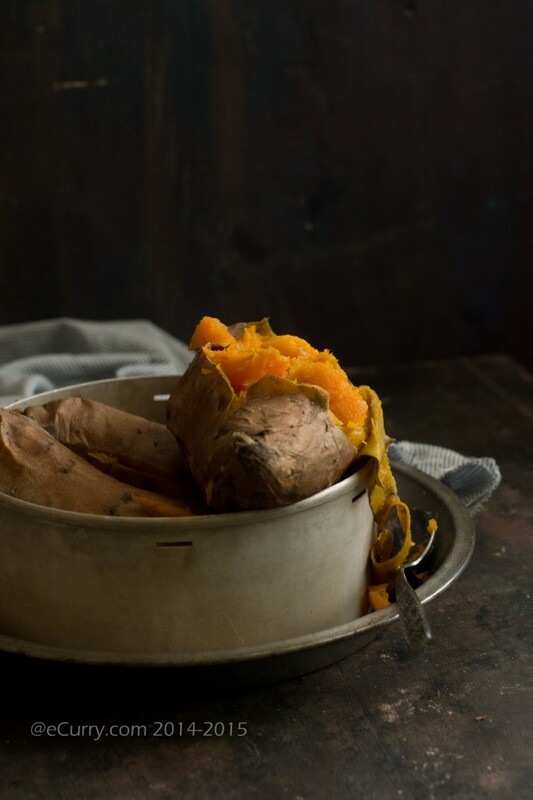 Make a couple of deep slits on the sweet potatoes with a sharp knife in several places. Cook them on the stove top/or pressure cooker until the flesh is tender. I steam them in the pressure cooker by placing them in a container and then placing the container in the water in a cooker, instead of directly placing the potatoes in the water. They can also be baked in the oven. The flesh should be tender enough to be mashed easily. Remove the seeds of the cardamom. Take about 5-6 seeds and powder them. Mix with the khoya/milk powder or ricotta ( or whatever filling you are using). Set aside. Remove seeds of 3 cardamom and powder them. Set aside to use later in the dough. To make the syrup, bring the water and sugar to a boil. Keep stirring until the sugar dissolves. Now add the powdered cardamom seeds, and saffron strand if your using them. Simmer until the syrup starts to thicken. It should take about 15 minutes and the syrup should be thick and sticky enough to coat the spoon, but will still be runny and you should still be able to pour it out. Set it aside. Once you are ready to dip the fried balls in the syrup, you will need to warm up the syrup. You can do it on the stove or in microwave. If you are using rose water, add it to the syrup after the syrup is done. 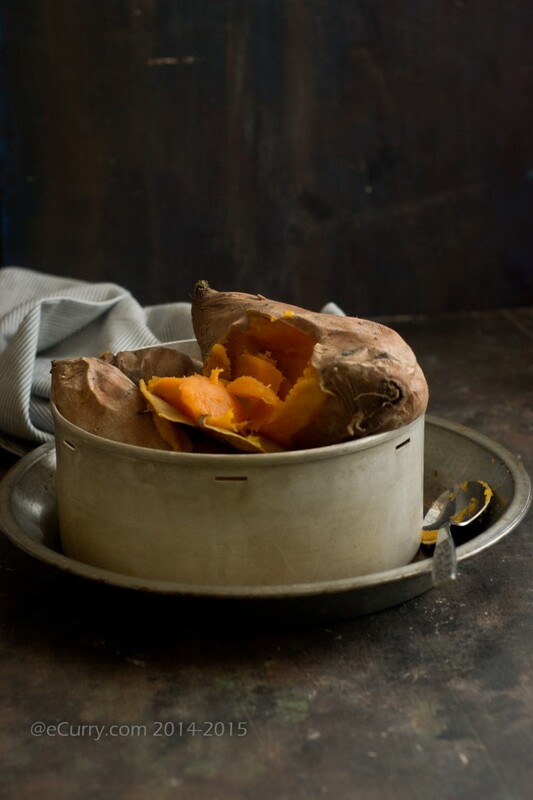 After the sweet potatoes are cooked, remove them from the pan/cooker/over; allow them to cool. Peel and mash them until smooth. 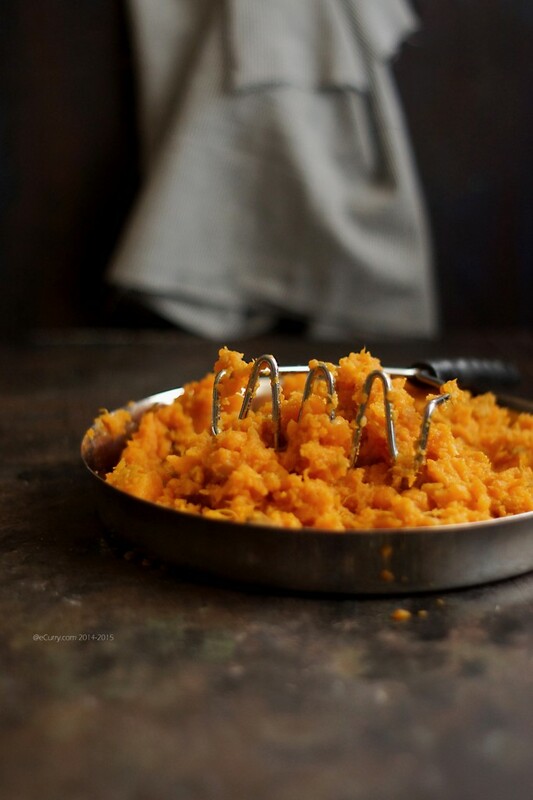 Now run the mashed sweet potatoes through a fine sieve to remove any lumps or fiber. Add the flour and cardamom seed powder to the mash and mix in well to form a dough. It might be kind of sticky. If your dough is too sticky and soft, you might need some water in a bowl to wet your palms and fingers. Scoop a key lime sized dough (about 3/4 -1 inch in diamter), roll it and flatten it a tiny bit, or make a dent with your thumb and place one cardamom seed and a pinch/about 1/4 of a teaspoon size of khoya/thickened milk (or whatever you have decided to use) in the middle. tightly roll between your palm to smooth the surface. It if feels too sticky, wet the palms of your hand and give it a shape. There should not be any crack in the shaped spheres. Repeat with the rest of the dough and set them aside in a single layer over a parchment paper or plastic wrap. Just to let you know that it is not required to shape them in spheres. They can be of any shapes. 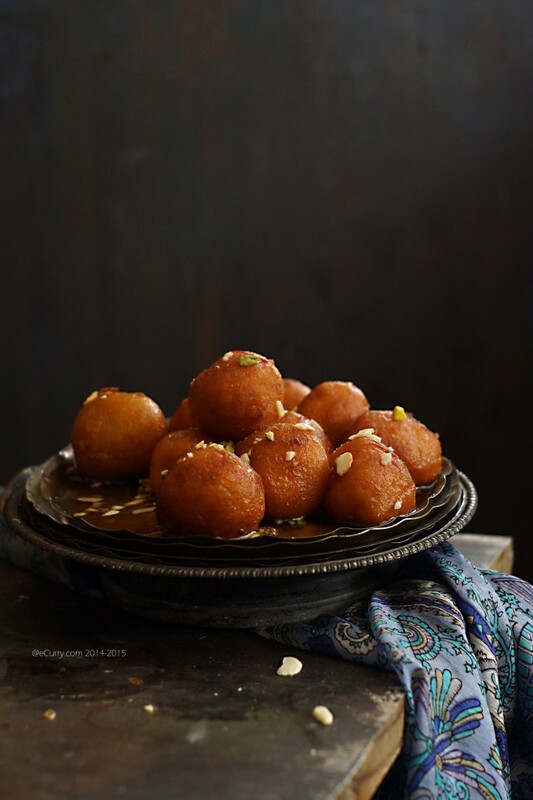 Traditionally it is made into the shape of a Pantua or Gulab Jamun which is a sphere. Heat enough oil to deep fry them in batches, about 6 in batch. 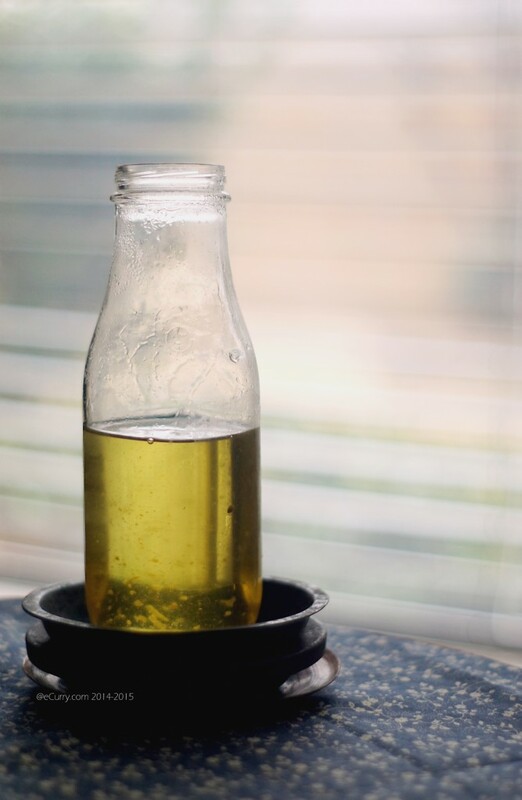 Once the oil is ready, place the balls in a single layer without crowding and cook them in until they are a darker shade of golden on all sides. Now reduce the heat to medium or even low. You want them to cook slowy now and the inside needs o cook too. If you cook at high heat, the outside will brown without cooking the inside. Cook slowy while ocassionally turning them over for them to cook evenly. Cook until they are darker shade of brown on all sides. Remove them with a slotted spoon and place them immediately in the warm syrup. Repeat for the rest of the balls. Allow them to soak in the syrup for at least 30-40 minutes. Longer will not hurt. They will absorb a lot of the syrup and get a bit bigger and also a lot softer. The syrup should soak through the inside. Beautiful. It will sound funny, but I miss Lakshmi pujo and Poila boishakh more than Durga pujo in India. Poila boishakh for some reason is very special to me. Loved the post and the drool worthy pantuas. Naboborsher agam shubhechcha tomay ebong tomar poribar ke. 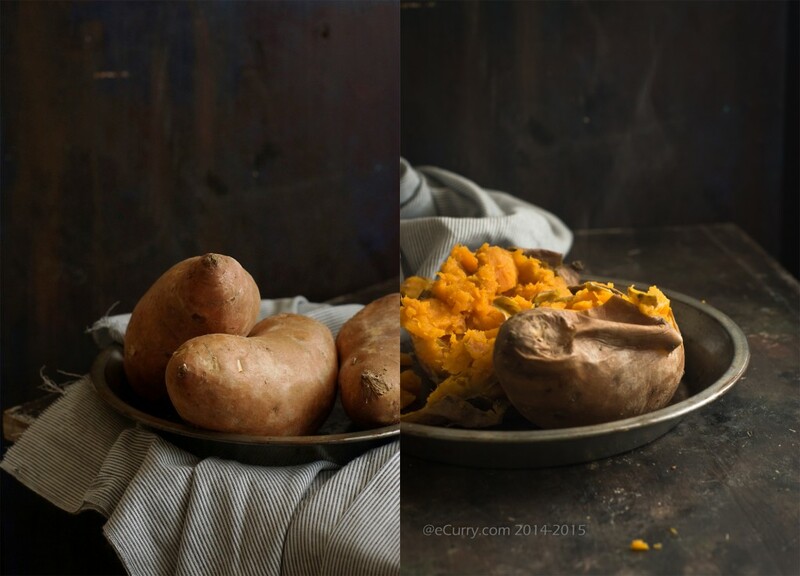 I love your blog and it inspires many of my kitchen adventures. I have been wanting to get my hands on this book for a while and it would be so much fun if I do win. Like you, I am a fan of her writing. Happy new year to you and your family. Divine! Those dumplings look irresistible. Delicious and lovely looking pantuas. Scrumptious pantua. I have been also thinking of making them but didn’t get around yet. I wish we were neighbors and I could try your picture perfect pantua. Naboborsher ogrim shubhechcha roilo. Soma, this is a beautiful post and the photos are amazing! Thank you for sharing. I love your site so very much! Wonderful and inspiring cooking! I ate absolutely authentic BengOli (that is how I pronounce Bengali:)food quite late in my life. I love all things simple, subtle yet classy and that is the reason I fell in love with BengOli food. Being a vegetarian does not give me much chance to boast a lot (about any cuisine) still, the love affair cannot be ridiculed. I am a huge fan of Bong dals, simple tarkaris and payesh!! and most importantly the language itself….most people dream of perfecting French pronunciation, I fantasize speaking BengOli, with loads of ‘O’s. Both your’s and Bong Mom’s blog reminds me of my only trip to Calcutta and all my Bong friends who live in nOstalgia called Kolkata :)Thanks for documenting so much of goodness in your blog. Dear, we are synchronized with our pantua and gulab jamun :-). Love your recipe and will try it next time I have heart to deep-fry and soak something in syrup! With ice-cream, they must be super yummy. Your pictures are lovely as usual. Along with sweets, art and music, Bengali was at one point the center of philosophy also! It has produced some of the finest thinkers, one of the recent ones being, of course, Rabindranath Tagore. These look just so tempting, Soma, and together with the warmth of all your cherished childhood memories, quite irresistible! You have made my day! Didn#t know about pantua before. lovely! Pictures too! Love your blog. The book sounds wonderful. I first came to experience curries through my young son who begged me to take him to Indian restaurants. I got caught up in his passion. So it was that having left the corporate & urban world for a small farm I started teaching myself to cook Indian dishes which I photograph and teasingly text to my son to entice him to come visit his mother. Looking for authentic dishes is how I found your amazing website. Judging from the response from my son, your dishes seem to be working! And it is with some amusement and pleasure that my very rural neighbours are now tasting foods they have never seen or even heard of before. I’m a big hit at our Friday get-togethers. So, I thank you for your stories full of love, care and passion and for taking the time to share your recipes so that others, such as myself, might discover and spread the passion around. I’m sure you will just the right person for Bong’s Mom’s cook book. It would be a delight if you consider this mom a candidate. I look forward to seeing a new recipe from you in my Inbox. There is always something unique and exciting. Although I grew up in India, there are so many different Indian cuisines that I was not exposed to, such as Bengali. Your blog has exposed me to many of these, and I look forward to trying many new dishes! As I was scrolling down the page, past pic after pic after pic, rushing to get to your recipe, I drooled all over my keyboard! I have made many of your recipes and I am surely going to do this one. Your food is so very tasty and makes my house smell lovely. I would love to win this. Your blog is amazing and that cookbook looks great. That excerpt from Sandeepa’s cookbook made me nostalgic – how deliciously similar our train memories are – you know, for people of the same generation. Those same steel tiffin boxes, trips to the zoo in winter, luchi-torkari-sondesh or dim sheddho-komola. Quintessentially Bengali. I’d love to read more of her book. I’d like to wish you “Shubho Nawboborsho” Soma. Beautiful pictures and story. 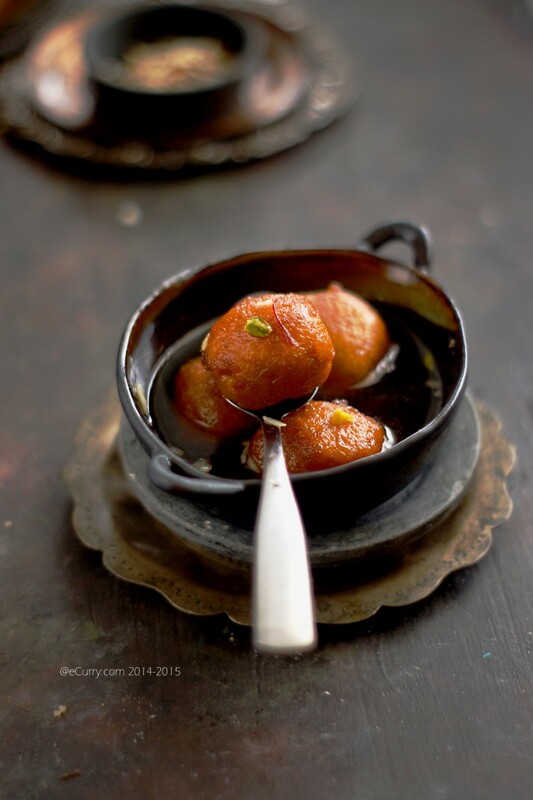 I have had Pantua/Gulab Jamun at an Indian Buffet and they are SOOOOOOO good! I never had any idea how to make them myself! Looks absolutely perfect and tempting.. awesome photography!! These look delicious. 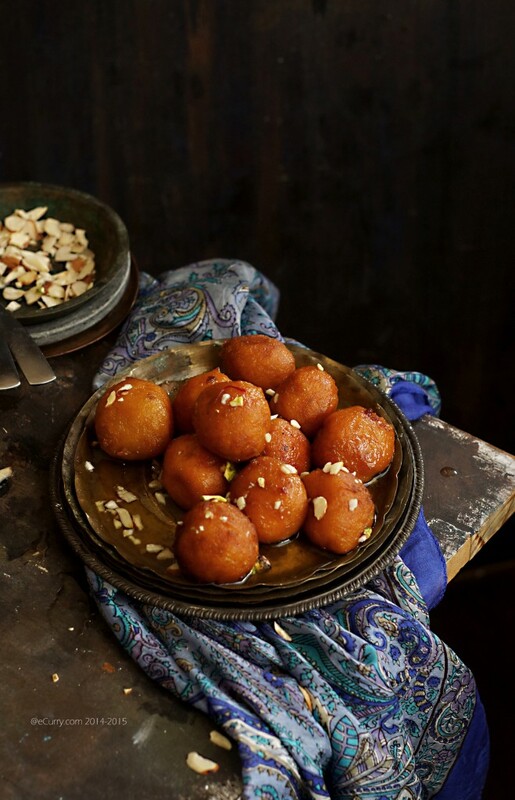 My favorite Indian restaurant in town makes these sometimes as a special treat and once my girls aren’t so little (and therefore have more time) I hope to make some too! 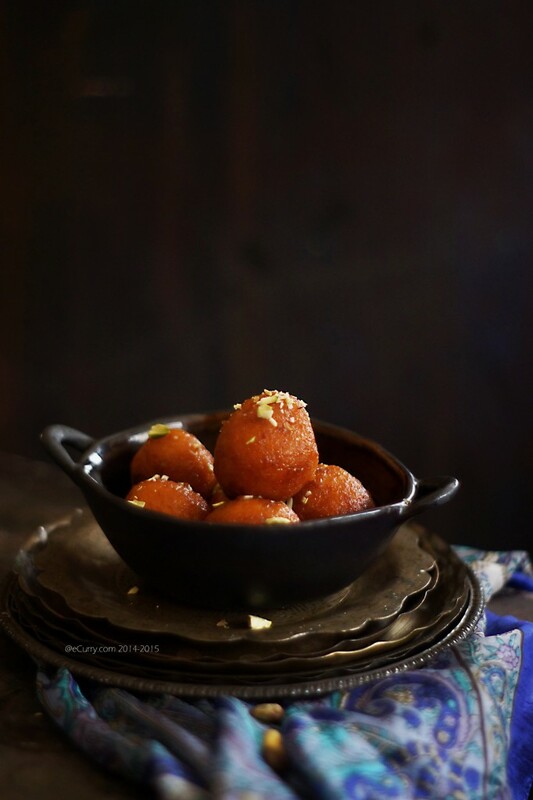 I have only been aware of Bengali sweets till date.. but love to follow your blog and have tried out some of Sandeepa’s recipes from her blog. Do hope I get selected for this giveaway.. Thanks. 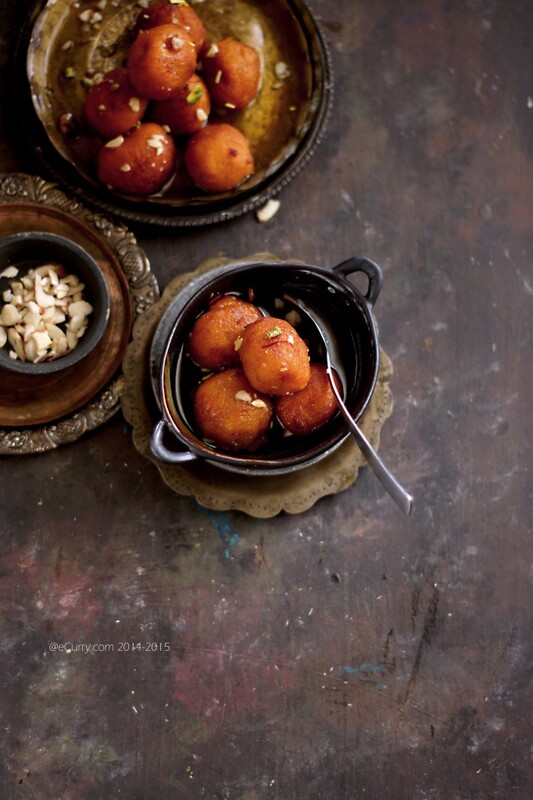 I love gulab jammuns but this recipe looks awesome and pictures are really good. I have weekness for Bengali Sweets. Love it. Feeling nostalgic! It’s been ages since I had Rangalur Pantua! Soon I will make some.. love the pictures! Shubho Nabobarsho! Pantua at its absolute best! How adorable those red, cute, juicy beauties look! 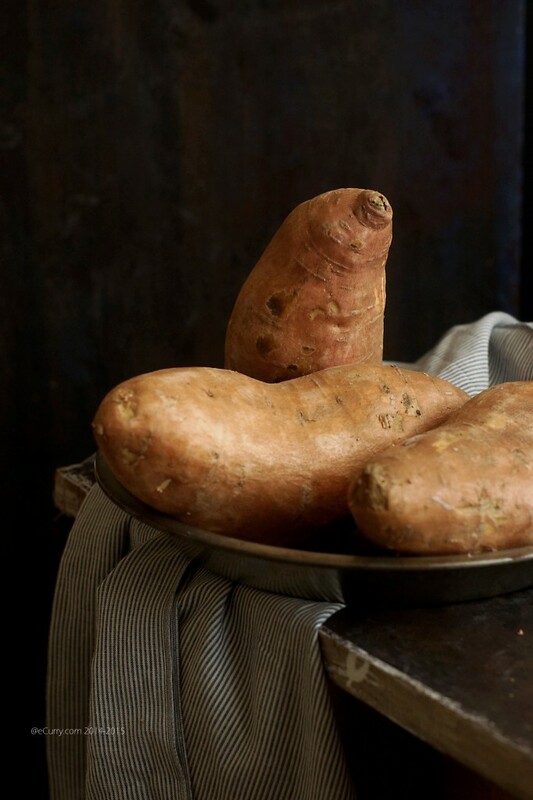 Using sweet potatoes as the star ingredient is a brilliant idea…and healthy…and something I must try! I love sweet potatoes, and these looks so good. I need to try this!